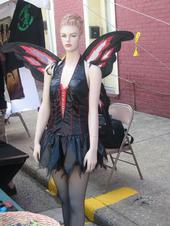 An attendee at a past Mothman Festival. MOTHMAN MERCHANDISE, COLLECTABLES, T-SHIRTS, JEWELRY, CRAFTS, POSTERS, BOOKS AND MUCH MORE! SEE THE SCOOBY DOO MYSTERY MACHINE! AMAZING FACE PAINTINGS BY JODY RIFE! CHECK OUT THE MOTHMAN STATUE ON 4TH ST.
RUN AND HIDE FROM THE MEN IN BLACK! MARK THEM OFF AS YOU GO! Jeff Wamsley, organizer of the Mothman Festival, poses in front of Gunn Park’s Mothman Statue, which will be the site of much activity during the forthcoming Annual Mothman Festival. Wamsley has seen the festival grow tremendously over the years and described seeing people attend as his favorite part of the event.